UPDATED: Tue., April 9, 2019, 9:33 p.m. Heavy raindrops poured onto Ian Shoemaker as he doled advice to a group of quarterbacks Tuesday at Roos Field, but his smile still beamed through the dreary spring football weather. Eastern Washington’s new offensive coordinator has plenty to grin about. Shoemaker inherited one of the most electric FCS quarterbacks in the country in Eric Barriere, a group of proven skills players and, perhaps the biggest component in last year’s run to the FCS national title game, four All-Big Sky Conference offensive linemen. He was in a much different mood when he toed the red turf seven months ago. Shoemaker, then the head coach at Central Washington, looked on as EWU piled up 677 yards in a 58-13 season-opening rout, the most lopsided loss in his successful five-year stint with the NCAA Division II program. The Wildcats, who recently won back-to-back conference titles under Shoemaker, were a lot more potent in their own weight class, averaging close to 450 yards per game with a balanced attack. Shoemaker had his share of FCS-level talent trickle through Ellensburg, including record-breaking quarterback Reilly Hennessey, a former part-time starter at EWU. Shoemaker, who replaces Bodie Reeder after he accepted the same position at North Texas, has a cupboard full of explosive, high-caliber players at his disposal. Shoemaker would know. He helped schedule games against three Big Sky programs (Montana, Portland State and EWU) in his five seasons. CWU will also face Idaho this fall. EWU head coach Aaron Best, who will enter his third season in the fall, hired Shoemaker in February. Best liked Shoemaker’s proven track record developing successful quarterbacks and his deep ties to Washington and its recruiting pipelines. Best also liked bouncing ideas off a former head coach who has a history of winning seasons. “I’ve been a head coach for two years and he’s been a head coach five, so (I’ll be) asking things he may like or dislike, his opinion on things,” Best said. Shoemaker’s ties to EWU didn’t hurt, either. His younger brother, Javid Shoemaker, played safety at EWU from 2000-04. Ian Shoemaker, a native of Orting, Washington, played his college ball at NAIA Grinnell (Iowa) College before working his way up the coaching rungs at a few small colleges across the country. He had a combined record of 38-16 at CWU, his first head coaching gig, before deciding to step back into EWU’s tradition-rich offensive coordinator role. His predecessor, Reeder, called plays for an EWU offense last season that averaged 528 yards and 43 points a game, marks that ranked third and fourth in the FCS, respectively. Reeder is now in Conference USA. 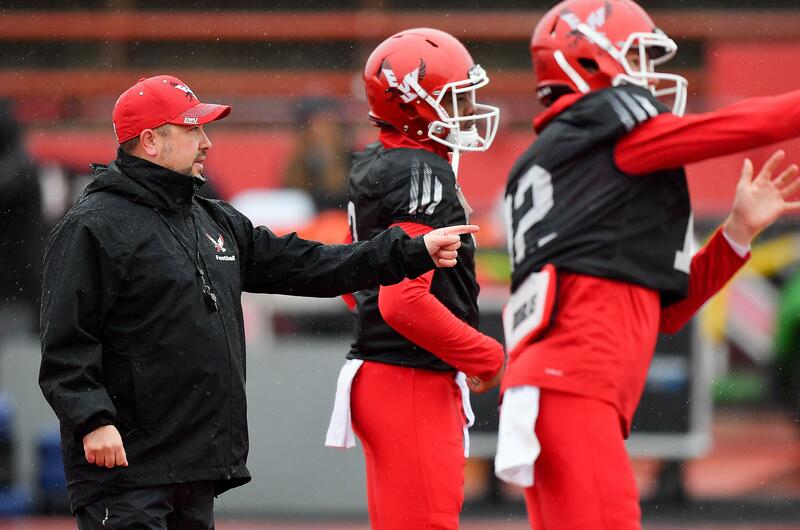 Former EWU co-offensive coordinator Troy Taylor accepted the same job at Utah in late 2016, around the same time former EWU head coach and offensive coordinator Beau Baldwin was named the offensive coordinator at California. “The success of the guys that have called plays here over the years is something that was intriguing and exciting,” Shoemaker said. Shoemaker wants to continue the balance the once pass-happy Eagles had in 2018, when they averaged 272 yards though the air and 255 on the ground. “I want to combine the great ideas they’ve had over the last few coordinators with what I can bring to the table, and find the best system to make that work,” he said. Barriere, a dual-threat who combined for 3,063 yards and 32 touchdowns in 10 career starts last season, said Shoemaker is incorporating a pistol formation – a hybrid of the shotgun formation and a single-back offense, in which the QB is only 4 yards behind center – into the Eagles’ schemes. Best said Shoemaker’s offense will be testing the pistol and other formations throughout spring camp. EWU will scrimmage the next three Saturdays. “Between returning Eric, what we have up front and that receiving corps, we’re going to find out what we’re good at, and that’s what this spring is about,” Shoemaker said. Published: April 9, 2019, 9:10 p.m. Updated: April 9, 2019, 9:33 p.m.